Freshman Florida senator and failed presidential candidate Marco Rubio is back in the headlines for failing to spell "United States" correctly. Seriously. Days before losing his home state and dropping out of the race, Rubio attempted to take Trump on on his own game, mocking the Republican presidential frontrunner for his childish antics and misspelled tweets. "And once a chocker, always a choker," Rubio said, feigning confusion as he read a Trump tweet to his audience at a campaign stop earlier this month. "I guess that's what he meant to say. He spelled 'choker,' 'c-h-o-c-k-e-r.' Chocker." Rubio would pick apart Trump's misspellings again: "He meant to say 'lightweight.' But he spelled it, 'l-e-i-g-h-t,' so he got that wrong." In another tweet, Trump spelled "honor" as "honer." "I don't know how he got that wrong, because the 'e' and the 'o' are nowhere near each other on the keyboard," Rubio said. 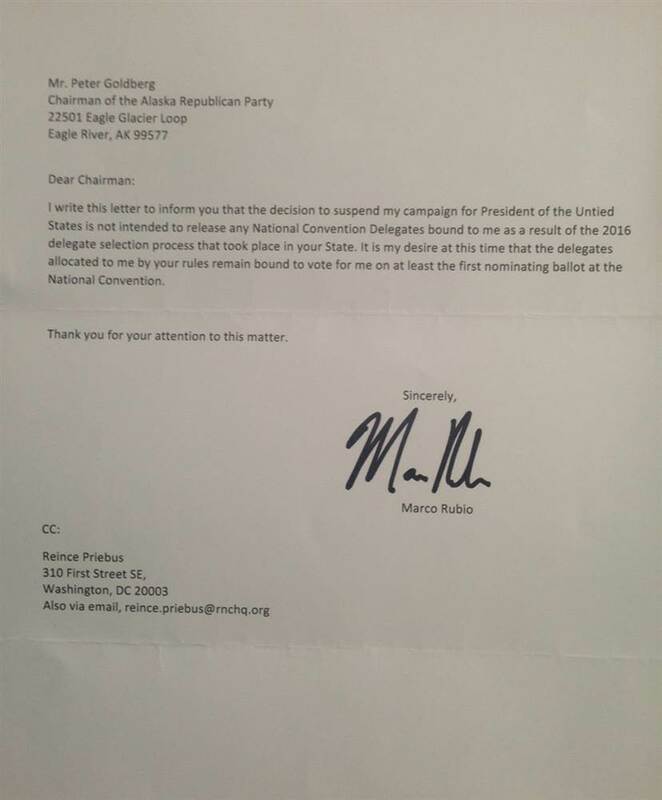 Well, in perhaps a rather odd final diss to his former rival, Rubio engaged in his own misspellings when he wrote to the Chair of the Alaska Republican Party requesting the five delegates he won in that state remain bound to vote for him at the Republican National Convention in Cleveland in July. If he convinces most state parties to maintain his delegates, that could effectively deny Trump 172 potential delegates from now through the first vote at this summer's convention. If Trump fails to win a majority of delegates during the primaries, he can try to make up the gap by winning over some of the 323 delegates thought to be up for grabs. Campaigns have talked about winning over those 323 delegates, a reference to delegates from states that don't bind their vote — which some describe as a GOP version of the Democrats' super delegates — combined with delegates backing candidates no longer in the race. The Trump Campaign, for example, has explicitly said it can woo those delegatesif it finishes the primaries short the 1,237-delegate majority. If Rubio is successful, however, he could cut that prized pool of delegates down to just 151. That means if Trump finishes more than 100 delegates shy of a majority, he is less likely to win the nomination on the first ballot.